But Sitnikov is neither rocket scientist nor satellite engineer. He was just a guy with an idea—and a Facebook account. He launched a competition on his page, where he has a few thousand followers, “so everybody could propose their own ideas about how to make images on orbit.” Along came Skolkovo Institute of Science and Technology, and the idea to use small satellites and reflecting sails that unfurl and furl back. With an array of 200 to 300 (and a few spares), StartRocket plans to use each satellite’s 10-meter sail as a pixel—when deployed, it’s “on”; when stashed, it’s “off.” In the lowest orbit, they’d each be about 100 meters apart. By lighting up different ones, it can create different images. “It’s not rocket science,” quips Sitnikov. The trickier part is keeping hundreds of satellites in tight, precise formation. It takes constant adjustment—repeatedly firing the satellites’ little thrusters and guzzling precious fuel—and precise knowledge of where the satellites are versus where they should be. But what the Astronomical Union wrote in its paper isn’t a law. Zeldine O’Brien, a barrister and an expert in space legalities, says that international law doesn’t prohibit space advertising. “There’s no explicit ban,” she says. “If anything, space law provides for free access and free use of space.” But if a country or an intergovernmental organization has signed on to the Outer Space Treaty, it is bound by its tenets: Basically, it says nobody can own parts of space, so be peaceful and carry out activities in the interest of all countries. Since there’s no global prohibition, if a company proposes something that could violate the rights of other nations, or infringe on others’ activities, the company’s home country and the launching country have to make the go/no-go determination (through the licensing and authorization processes). They also could be liable for the behavior of space companies who operate within their borders. But—bear with the trolling here—might there even be some good to be found in this obtrusion? O’Brien, in a paper called “Advertising in Space: Sales at the Outer Limits,” points to an argument made by assistant US attorney Frank Balsamello: “If revenue from space advertising is used to fund expanding access to and exploration of space, Balsamello suggests the activity could be considered as being in the common interest of all mankind,” and so in line with the Outer Space Treaty. No one’s tested this out IRL, though. Plus, according to J. H. Huebert and economist Walter Block, this is not so different from planes flying LUV U banners, or the Goodyear Blimp. 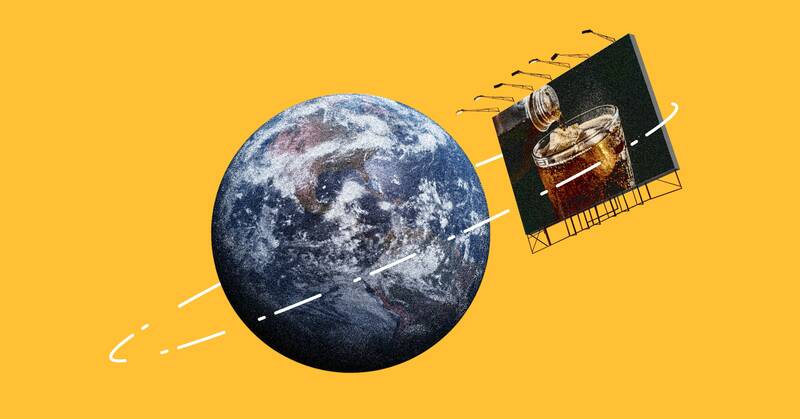 Their “In Defense of Advertising in Space” presents aesthetic counterarguments (some people like billboards, for example) and scientific ones (maybe astronomers shouldn’t take precedence over commercial interests). No one’s sure whether these obtrusive plans will take off. Nonobtrusive logos, such as Blue Origin’s feather and NASA’s meatball (don’t @ me, it’s an ad), have been with us in space always. But after 60-plus years of space launches, no one’s actually pulled off a proverbial space billboard. Maybe it’s not worth the technological and regulatory effort. Maybe the backlash from people who hate Loca Cola and love telescopes will prove too high a cost.